All transactions are safe and secure with a reliable history in online purchasing behind each of our associates. 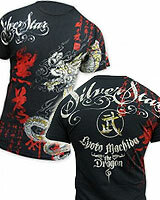 Buy the UFC Silver Star t-shirts to own UFC clothing and merchandise. The UFC's trademarked "Octagon" has become the league's most recognizable component. The fenced in canvas battleground is a place where the UFC's ultimate fighters are both crowned and destroyed. Celebrate the Octagon with this official Machida Silver Star UFC t-shirt that displays the Silver Star UFC logo on the front. The league's full title is "Ultimate Fighting Championship" and it consists of clothing brands like Silver Star. Wear it to cheer on Lyoto Machida at the next match you attend. In addition to the UFC Silver Star tees above, browse the UFC Clothing Gallery for more apparel like men's and women's clothes, kids shirts or hoodies.